Carbon Literacy is relevant climate change learning that leads to positivity and action towards reducing carbon emissions. 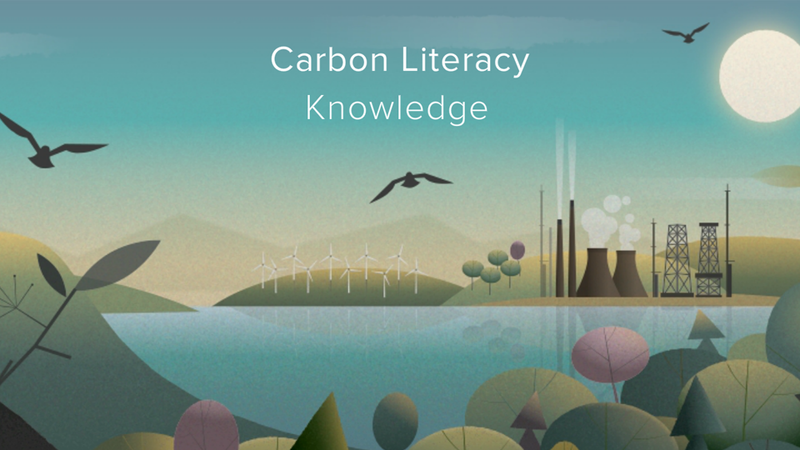 The Carbon Literacy Project works to provide you with access to this learning so that you can become certified as Carbon Literate. More than just small personal changes, Carbon Literacy highlights the need for substantial change and supports you, as an individual, to have a cascade effect on a much wider audience – whether it’s in your workplace, community, school, university, place of worship, or another setting. A Carbon Literate citizen understands how climate change will affect them and the people around them, both geographically and sectorally. A Carbon Literate citizen has acquired the knowledge and skills to develop their own responses to lowering their carbon footprint, and the carbon footprint of others, whilst having the confidence to share their Carbon Literacy. Carbon Literacy is a desirable asset for any employer. A Carbon Literate citizen will display compassion for the environment, their health and the health of those around them. This makes them directly more employable. 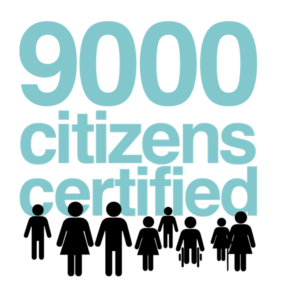 Certification is awarded following the successful completion of an approved Carbon Literacy course whereby each learner is awarded a uniquely-coded Carbon Literacy certificate to reference that achievement. In order to become certified as Carbon Literate, you must take part in a day’s worth of accredited CL learning. A day’s worth of learning can be achieved in a number of ways: E-Learning, Workshops, and/or Self-Directed learning (e.g. homework set by your trainer) and must add up to at around 8 hours. Have a chat with us or your trainer to see how your training will be delivered. 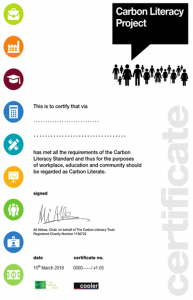 Following successful completion of the course, you will be awarded a Carbon Literacy certificate which will be unique to you. Carbon Literacy training is currently being delivered by a wide range of trainers and organisations, to workplaces, communities and places of education – this list is constantly growing. Check out our certified Trainers and Training Organisations for a flavour of who is delivering training at the moment. – Please check our Events page for open Carbon Literacy courses in your area. – You may be able to study the science of climate change by purchasing the CL: Knowledge e-learning course and then seek a workshop to complete the group based elements of your CL training. Alternatively, there may already be networks of organisations that you identify with that could provide you with Carbon Literacy training – if in doubt Contact Us. – Speak to a colleague, manager, CEO, housing association, community network, teacher, lecturer or similar about rolling out Carbon Literacy within your organisation, community, or place of education, then Contact Us and we’ll advise you on the next steps. Have a look to see how you can Get Started. Attending the interactive workshop not only made me aware of the impacts of my daily actions on the environment but helped me gain insight on how to evaluate the impacts businesses make on the climate. It also distinguishes me from other students when I apply for jobs. "A brilliant thought-provoking session. I walked in knowing very little about how to sustain our planet and walked out with so much information and knowledge which I felt the need to spread. The session was so informative and coherent and really expressed the need for change." I found the Carbon Literacy training really interesting and thought-provoking as it was not only relevant to a community food project I’m involved in setting up, but more so the basic everyday aspects of life and our personal impact on climate change. On reflection, it didn’t seem so much like ‘training’, but a relaxed informed discussion with some relevant fun activity. Since the training, in our community project, we’ve taken on the challenge to create some specific carbon sinks with a series of tree planting schemes with the residents, local schools and other groups in the area. A really good and well rounded day which highlights the issues we are facing but also gives excellent routes towards helping to become part of the solution. Not all doom and gloom, and not just a day of being talked at! Hugely valuable. Many thanks. I gained my Carbon Literacy certificate while I was in Year 5! The reason we were able to achieve this award is because we answered 3 questions: What is climate change? What causes climate change? What can we do to stop climate change? We are really happy that we have possessed this knowledge because then we can pass this knowledge onto our parents and then our family and it would keep being passed down. Therefore we are helping to stop climate change! CL: Knowledge e-learning can be used in conjunction with, or independent to an accredited CL course. Because of the requirement to work with others, a learner cannot currently become fully Carbon Literate through online learning alone, but completion of the e-learning course generates a CL: Knowledge interim certificate, with the learner being approximately half-way through their “days worth” of training to become Carbon Literate.